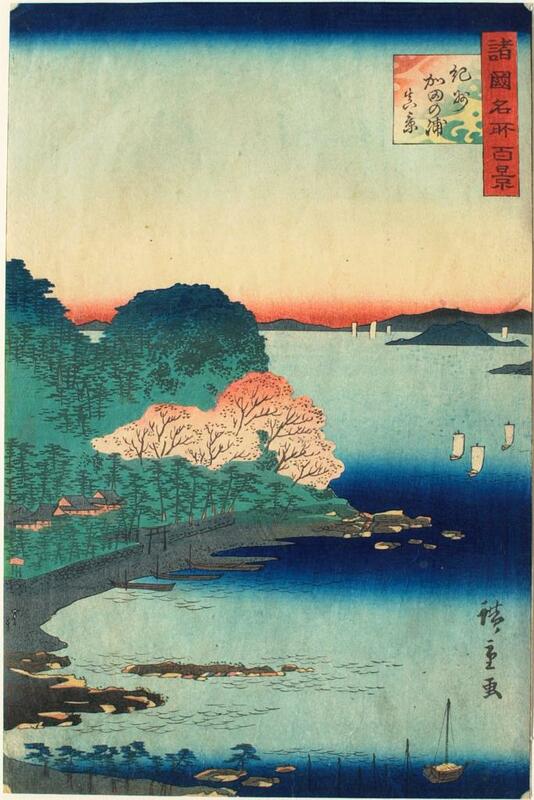 Hiroshige Utagawa, 100 Famous Views of the Provinces (Shokoku Meisho Hyakkei): View of a Promontory. Color woodcut on paper, 1859-1864. Sterling and Francine Clark Art Institute, Williamstown, Mass. Searchable website with links to information on artists, art movements, works of art, art galleries and sales, and art museums. Search for artists by name or browse by art movement, and click on links to images of works of art on museum websites. Some parts of the database are available only to subscribers; Clark does not subscribe. Gateway site; includes links to museum websites and those areas of online websites (such as Michael Greenhalgh's site at the Australian National University and the Web Gallery of Art) having to do with prints. A list, compiled by Peter Fuhring, of publishers and dealers of prints active in Europe and the Americas before 1900, along with the date of publication of their catalogs or stocklists, which are identified only by their dates. Offers a spare but carefully chosen selection of resources for the study and care of prints, including basic bibliographies on the care of prints, printmaking techniques, researching the authenticity of a print, defining a print, and determining the value of a print, plus general publications and links to online resources. Also houses the "PCA Search Index to Print Catalogues Raisonnés" (annotated above), the online version of The Print Council Index to Oeuvre-Catalogues of Prints by European and American Artists. Search more than 100,000 objects in the online database of Vienna's Albertina Museum. Results include bibliographic information and high resolution images. Searchable database of the online collection database at the British Museum. Search the site by keyword, e.g. an artist's name, subject, technique (search "etching" for example). Unlike most sites the information that accompanies each work includes robust and scholarly discussion, bibliography, and a thumbnail list of other similar works. Website created by the Connecticut College Visual Resources Department on the Wetmore Print Collection and the Black Print Collection: original etchings by Rembrandt, woodcuts and engravings by Dürer, and Japanese woodcuts, as well as a collection of prints by three American artists. Browse the indexes to find images and cataloging information. Searchable database of the FAMSF collections, including the Achenbach Foundation for Graphic Arts. Advanced search interface no longer available. Search the website (as opposed to the ImageBase) for "achenbach" to find out about recent exhibitions of material from the Achenbach collection. Click "Collections" and "Works on Paper" to find out more about the Achenbach collection and to see highlights from it. Browse the online collection by selecting category, then type, then "browse by artist" or "browse by title"; or click on "Advanced Search" for more options. Browse featured collections, or use the box at the top of the page to search the collection of almost 112,000 prints from 1450 to 1997 by artists around the world. Select options at left to browse by Creator/Related Names, Subjects, or Formats. An exhaustive catalogue of the museum's 140,000 works on paper, by some 4,500 artists. It provides access to the drawings, cartoons, pastels, and miniatures listed in the original handwritten inventories of the Cabinet des Dessins of the Musée du Louvre and the Musée d'Orsay. Works may be searched by inventory number, artist, school, date, subject, or technique, or in the context of the history of the collection. Information about the artists (in French) is also provided (lives, works, style). Browse or search over 100,000 works in the museum's collection. To search, click "View all artworks within Drawings and Prints", and then use the options on the next page to refine your results. Browse the MFA's extensive collection of works on paper by following links at the bottom of the page, or search by clicking "Advanced Search" at the top left of the page. Search almost 19,000 online works from MoMA's Department of Prints and Illustrated Books. See also the website for the2008-9 MoMA exhibition The Printed Picture, which explores the history of the printing of images, and includes short videos and information about many techniques, including various forms of digital printing. Search the National Gallery of Art collection. Searches can be performed using artist name, keywords, credit line, provenance name, accession number, exhibition history, and/or catalogue raisonné. In many cases records include full-screen and/or detail images; in addition, records often provide provenance, inscription, exhibition history, and bibliography. Enter search terms in the box at upper right of screen to access the SMA's print collection, including works by Cranach, Durer, Holbein, Mantegna, van Leyden, and others. The printroom's website also includes a page on print connoisseurship, a glossary of printmaking terms, and highly detailed image maps of different printmaking techniques.